545 pages of history and genealogy for 30 counties in the East Tennessee region including 938 family biographies. This book was originally published in 1887 by the Goodspeed Publishing Company. An informative and historical overview of the East Tennessee region including ALL of the following counties: Anderson County, Blount County, Bradley County, Campbell County, Carter County, Claiborne County, Cocke County, Grainger County, Greene County, Hamblen County, Hancock County, Hawkins County, James County, Jefferson County, Johnson County, Loudon County, McMinn County, Meigs County, Monroe County, Morgan County, Polk County, Rhea County, Roane County, Sevier County, Sullivan County, Unicoi County, Union County, and Washington County. An important resource for the study and research of the East Tennessee region history (including Civil War history) and genealogy. This fascinating and detailed book is on CD in Adobe Acrobat pdf format and contains ALL of the following family biographies from 30 East Tennessee Counties (in addition, thousands of additional individuals and surnames are mentioned within these biographies - well over 10,000 individuals are made mention of.) Many of these individuals were residents at various times in several different counties so they may be found in a different county than what might be expected. Section One: Histories of each county in the East Tennessee region: These are brief histories averaging between two and ten pages each. This section has a total of 142 pages. Section Two: Military History: This is largely Civil War history of military units formed in the East Tennessee region. This section contains 16 pages. Section Three: Family Biographies of the East Tennessee Region: This is the largest section of the book and includes 938 family biographies. More than 10,000 individuals are made mention of throughout the text. This section has a total of 362 pages. The cost for this CD containing this entire book on CD (Adobe Acrobat pdf format) described above is only $9.95 plus shipping, or only $6.95 as a digital download! A great deal of history and genealogy (545 pages) for very little cost! A truly fascinating view of the East Tennessee from its first settlement to 1887. 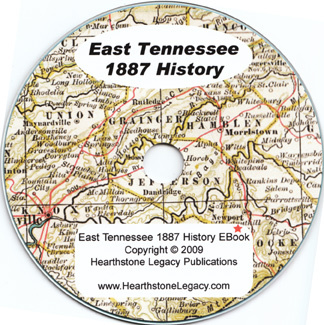 Since we sell many different county history and genealogy CD's, please be sure to specify that you wish to order the History of East Tennessee Region CD. If ordering more than one CD, the shipping cost is $1.95 for the first CD plus only 25 cents shipping for each additional CD purchased.